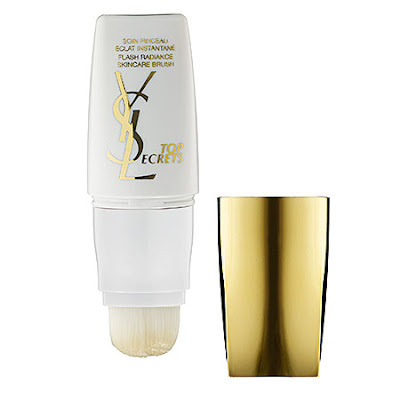 I've found my soul mate ... and its name is the YSL Top Secrets Flash Radiance Skincare Brush. This handy-dandy little tube contains one of the most ingenious primers I've ever had the delight and fortitude to come across. To begin with, the packaging is divine. Pull off the gleaming gold top to reveal a fluffy white brush, which actually remains in the off position until you twist it to the right. Once twisted, it activates the primer within ... and this is where the real magic happens. YSL claims that Top Secrets "instantly erases the signs of a fast-paced lifestyle." This beauty chick is here to tell you that this sentence could not be closer to the truth! A refreshing, cooling white gel seeps onto the brush that, once applied, seriously works to eliminate all telltale signs of stress, worry and fatigue from your face. A combination of grains of paradise and caffeine minimize dullness, while light-reflecting micro-pigments reflect and diffuse light over the complexion. I've been using this primer underneath my moisturizer each morning, and I've seen a radical improvement in my skin's texture and overall glowiness. It really does perk up the skin immediately! YSL Top Secrets Flash Radiance Skincare Brush retails for $55 at sephora.com. Omg that looks divine. I just might have to sell my younger sister to get some of this stuff, but it'll be so worth it.